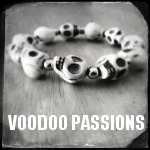 By voting on the books listed, you can help to determine whether a book is related to the theme of Voodoo Passions, or whether it is a non-related, but popular, book among the members of the site. If you believe a book in the list below is 'on theme' with Voodoo Passions, vote that it is relevant. (If you don't know, just skip it.) Over time, we hope to have a library of books that should be of interest to Voodoo Passions members. In this book, you will find a plethora of authentic Voodoo and hoodoo rituals for love, justice, gambling luck, luck in court, prosperity, health, crossing, hexes, curse removal, and much more. You’ll learn how to make, use, and properly dispose of your Voodoo doll. Be warned: this is some of the most effective magic that exists so be ready to reap what you are about to sow, or in this case, sew! Understand Voodoo’s underlying ideas and make use of its power with illustrated instructions and exercises. Read this book prayerfully, with a Bible at your side and an eye on the realities of life in Haiti. Denise Alvarado was born and raised in the Voodoo and hoodoo rich culture of New Orleans. In The New Orleans Voodoo Handbook, initiated Vodou priest Kenaz Filan covers the practices, tools, and rituals of this system of worship as well as the many facets of its origins. This book fills a long-standing need in the literature: Voodoo, Santeria, and Macumba as practised today in cities throughout the Western world.